Here is a list of 19 best free typing speed test software for Windows. 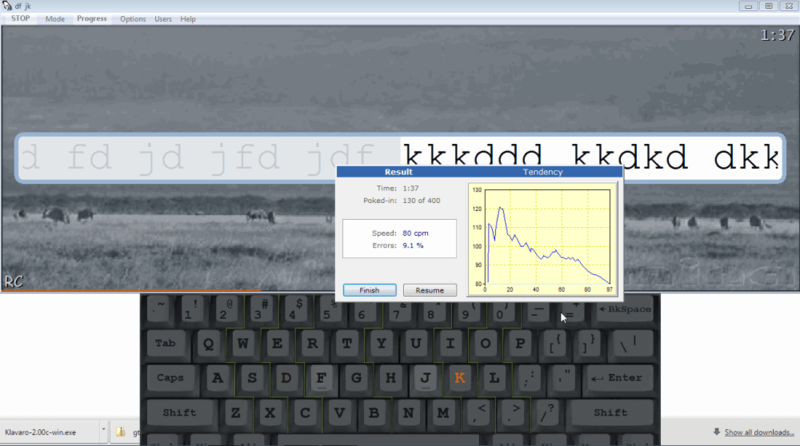 These free software let you test your typing speed for free and help you type faster. These software offer a number of features like: choose your own text, free typing test, monitor your performance, free typing games, typing games for kids, teach basics of touch typing, etc. Today’s world is driven mostly by computer technology and most organizations require candidates with decent typing speed. So, it is quite necessary to know your typing speed and improve it to increase your efficiency. Amphetype is my favorite typing speed test software, as it generates lists of areas which needs more practice. You can focus on specific keys, words, and trigrams to optimize your typing speed. It also generates lesson based on the weak areas, so that you can improve your typing. You can also check out the list of Online Typing Tutors, Typing Tutor Software and On-Screen Keyboards For Windows. Amphetype is very good typing speed test software. Based on the test it generates the typing speed statistics. It also generates a list of data on slowest, fastest, least fluid, most fluid, least accurate, most mistyped, most common, most damaging set of keys, trigrams, and words. This list can be sent to the lesson generator which generates personalized lessons for you. You can edit the lesson in the lesson generator. This speed testing software lets you add your own text so that you may take a personalized test. Catchysoft Gepard is another free software to test your typing speed. The software comes with two different layouts, which depend on the keyboard layout you use, which can be English (USA) Dworak or English (USA) Standard. It starts with a basic lesson where you will have to type random alphabets, numbers, and punctuation marks. To test your typing speed, you will have to change the typing mode by choosing 100 symbols per minute from the improving menu option. Different words will be displayed on the screen of the software, you will have to type them with your keyboard and at the end of it, the software will show the result of "how your typing was". The result is shown as Speed (last line) displaying how many symbols per minute were typed, Average speed (for 300 last typed symbols) per minute, and the number of errors you made. 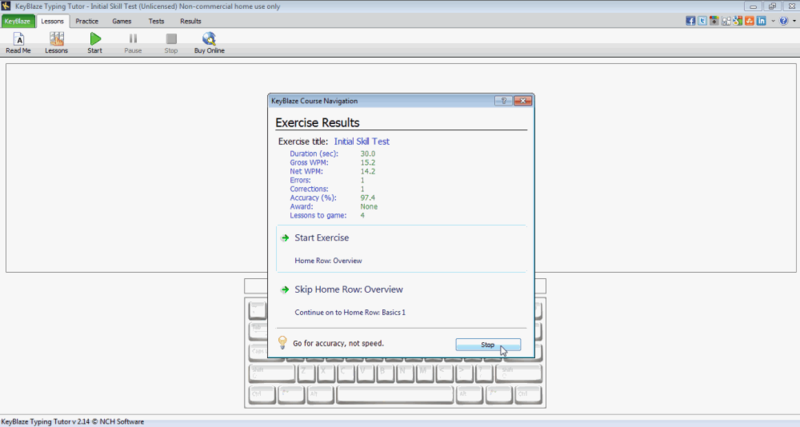 Free Typing Test is free typing speed testing software for Windows PC. It gives sample content in the top window, and you will have to type the given content in the bottom window. If you don't want to continue with the typing speed test, then you can end it by clicking on "give up button" on the top bar. Whenever you start a new typing test, it gives new random content to type and check your typing speed. A good feature in the test is that it stops typing if you enter wrong alphabets, or punctuation marks. Every alphabet or punctuation that has to be typed is highlighted with red color. 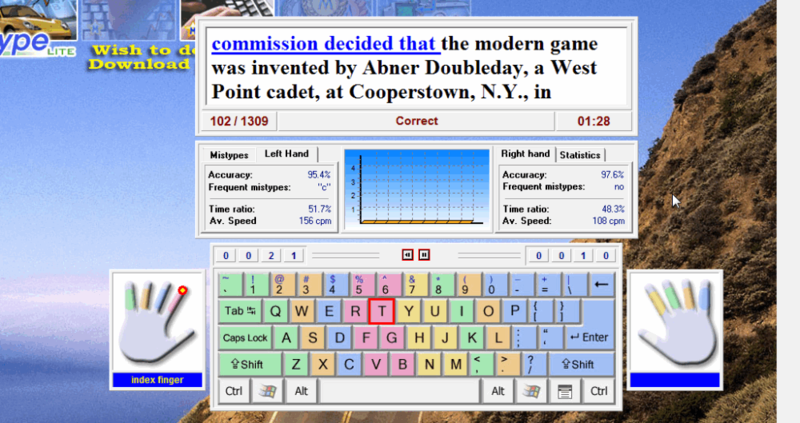 After the completion of the typing test, the result is shown with details of keystrokes per minute (KPM), Words per minute (WPM), Time (seconds), and Errors. Gabe’s TypOmeter is a freeware which monitors the typing speed and displays the current status while you type. You can test your speed by taking the typing training test and view the performance. It displays different data, like: total clicks ever, key presses, mouse clicks, words written, A4 pages, good keys, bad keys, special keys, keys per minute average/Max, words per min average/max, time worked, time started, time idle, and much more. The above data can be viewed in a graphical format. It also keeps a record of the software on which keystrokes were used. 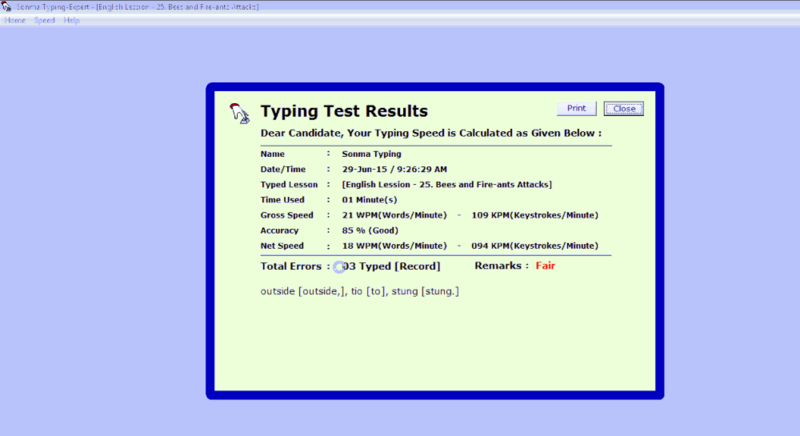 Somna Typing-Expert is another freeware typing speed testing software. You can test and increase your typing speed for free by taking tests with the selected time duration of 1 minute to 15 minutes. It lets you select your own custom text to test the typing speed. After the test, the test result displays the Gross speed and Net Speed in Words per minute, and accuracy in percentage. It also displays the keystrokes per minute. The printout of the test result can be taken. It has a set of hotkeys to carry out different tasks like: new text, pause, resume, menu, exit, etc. 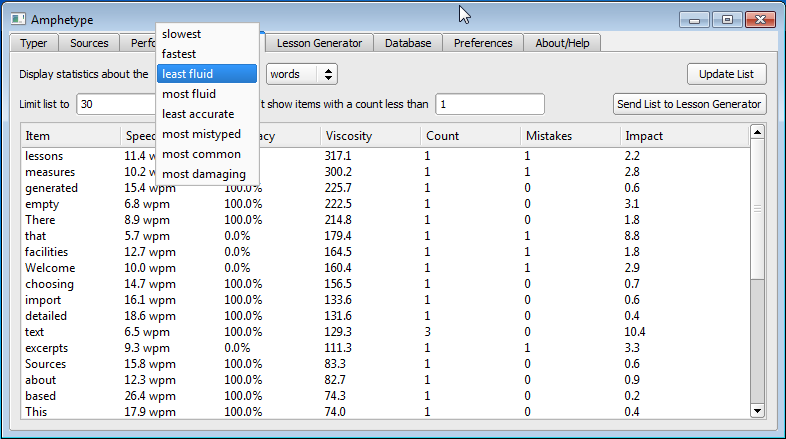 TypeFaster is quite a useful typing software for both learners and teachers. Using this software as a teacher, you can assign tasks to students, and monitor their progress to know their typing speed. You can also add your own words to the available typing games. It has a number of lessons which can be practiced and assigned to the students. As a learner, you can learn typing through various chapters. The progress shows the weak areas on which you need to lay focus. You can practice from a set of personalized keys or text. 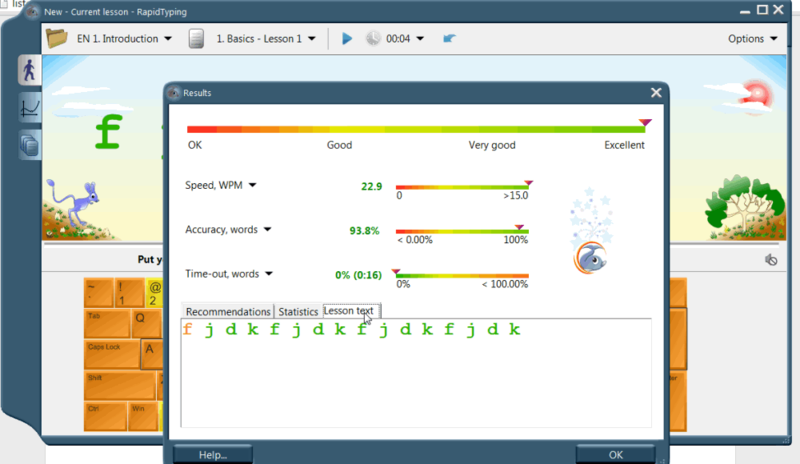 Kiran’s Typing Tutor is a free typing software to test your typing speed. You can take custom test from any text file. 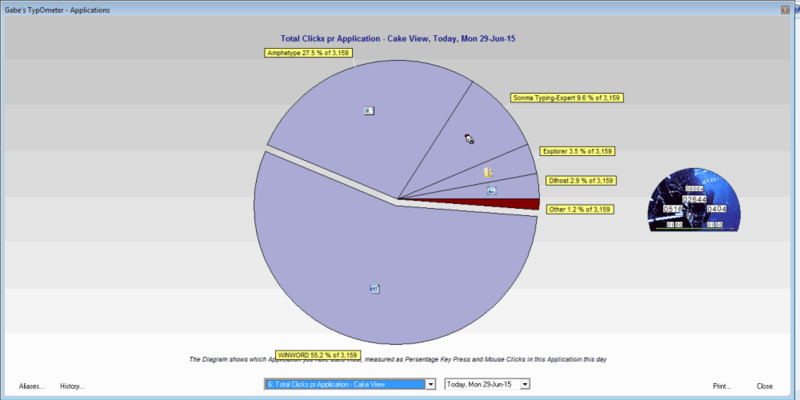 You can monitor the progress with the help of options like: accuracy, word per minute, keys per minute, and errors. You can also monitor your progress in graphical format, and print it for later use. There are other options to choose from, like: typing lessons, typing practice, typing tests, and typing games. It also has typing games for kids to teach them typing. This typing test software also provides you the option to master the numeric keys. It lets you choose font options of the text and set targets before moving to the next lesson. RapidTyping is a software which helps you test and increase your typing skills. The typing statistics are displayed in a very detailed manner, which contain all the details of the typing history. The statistics contain the overall performance, speed in Words per Minute, and accuracy. It contains numerous lessons for different levels of typing. You can create your own lessons to learn typing by uploading different types of files like TXT, HTML, XHTML, XML, PHP, INI, C, CPP, JS, PL, PY, RB, SH, SCPT etc. You can select and choose to learn typing in other languages like German, French, Spanish, Russian, etc. The software also lets you choose the keyboard layout. 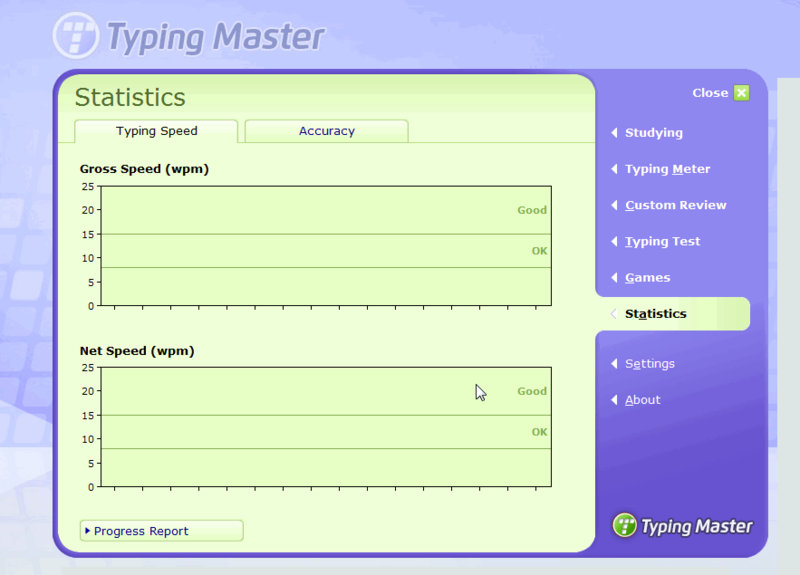 Typing Master lets you monitor your typing speed, and helps to increase it gradually. The test results are displayed with the help of statistics, which display the typing speed as gross speed, and net speed. In accuracy tab it displays the accuracy percentage along with the difficult keys. The progress report displays the complete statistical data of which can be printed out, or can be saved as PDF. There are numerous other options like: basic typing lessons, games, or typing practice. 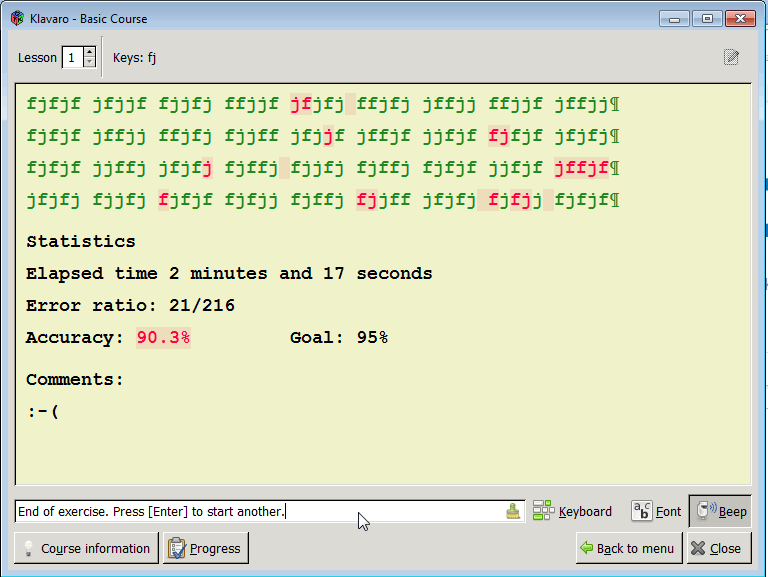 KeyBlaze Typing Tutor helps to monitor and increase your typing speed. The results are displayed in a graphical interface showing the typing speed under different sections, like lessons, tests and games. It displays the best speed and best accuracy data to improve your typing speed further. It has specific sections designed for different age groups, and people of different intellectual levels. You can select your level during the installation, and change it at any point of time as you progress. It also contains a small tutorial on touch typing. 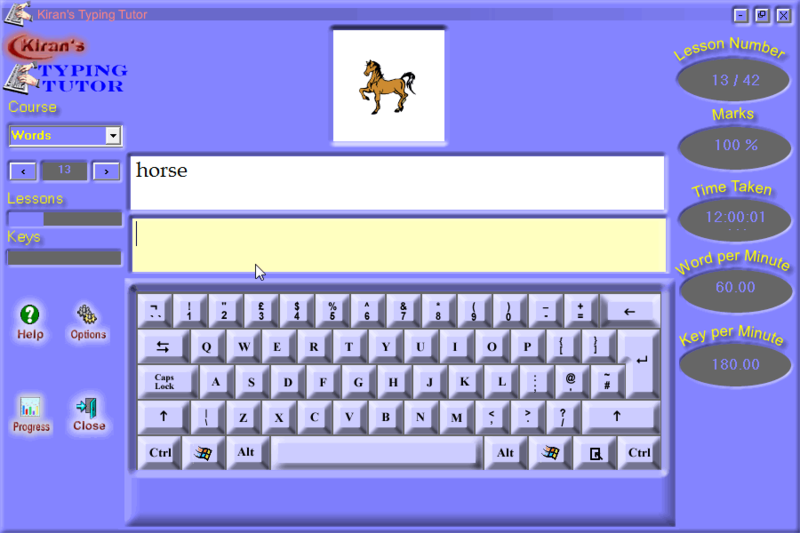 It contains a set of lessons to properly teach the basics of typing. This software helps you to practice by using dictation or viewing on the screen. It also contains typing games: Key Blizzard, 30 Seconds to Type, and Typing Hero. Typing Test TQ is a basic and light typing software. 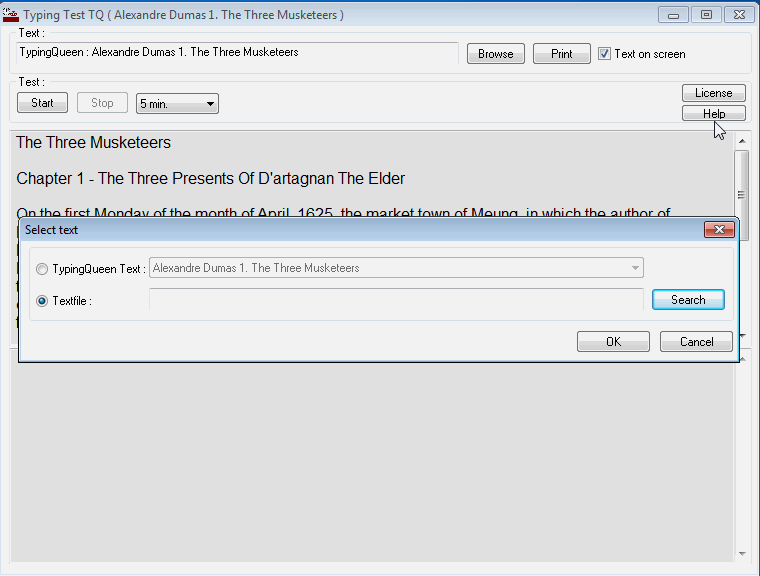 In this software you can select any sample text to view and type, or add your own text file. You can take the test to check your typing speed for a given time duration; however, you can stop the test at any point of time. After the test it displays the results along with the mistakes made at different locations. The results include: test duration, errors, characters, keystrokes, gross speed, characters per minute, key strokes per minute, net speed, errors/characters, errors/keystrokes, and accuracy. The results can be printed out for comparison with previous/other results. Typing Speed Test is a flash player based typing game. 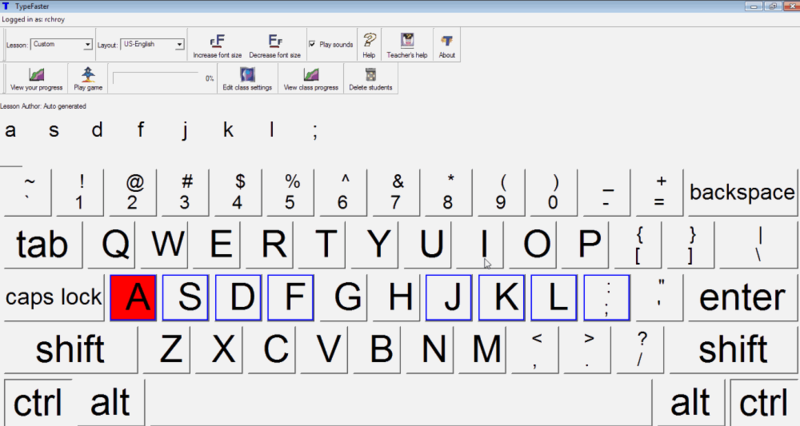 In this software you need to type the text as displayed in the typing area. The current time speed and accuracy of the test is shown, which changes as you perform. After the test is completed the final result is displayed with the overall speed and accuracy, and a rank is provided for your performance. The scores can be shared on social media sites like Facebook, Twitter, Email, MySpace, and Google+. 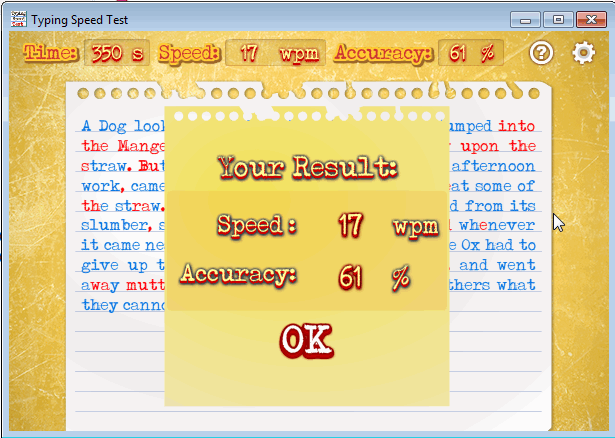 Klavaro is a basic typing speed test software. It contains different sets of lessons to evaluate the typing speed at varying difficulty levels. The statistics display elapsed time, error ratio, accuracy and goal. It contains five different chapters, with one chapter containing the basic introduction to teach typing basics. It mainly describes the finger location and which fingers to be used for different keys. Rest of the chapters offer you typing practice at varied levels of difficulty, after which the results are generated. Stamina is a simple typing software which monitors, and helps to increase your typing speed. It has a simple interface where the text is displayed and a space is provided for typing. At the end of the test it displays the test result as Characters per minute. It also displays the report which contains errors with speed. 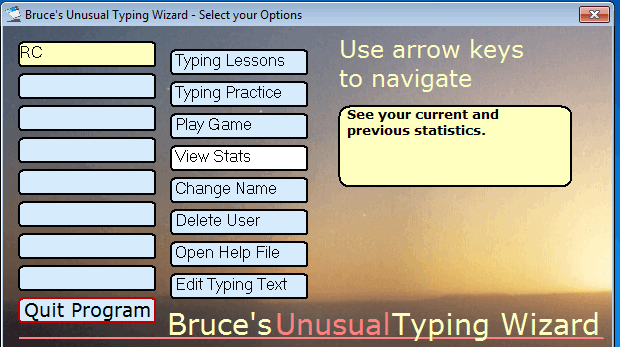 Bruce’s Unusual Typing Wizard is a lightweight software to test typing speed. You can take the test after which the statistics are shown which contains the time spent typing, percentage of accuracy, and speed in words per minute. It also has the options to turn the Artificial Intelligence as on or off to adjust and monitor if one or two letters are typed wrong. You can also select the option to either enable the use of the backspace key or disable it. It also trains you in typing by the use of lessons and typing practice. MaxType LITE Typing Tutor lets you check the typing speed. You can choose from a set of pre-installed texts or upload your own texts to check your typing speed. It lets you test and increase the coding speed by letting you choose source code of Perl, C++, Java, Pascal and assembler. 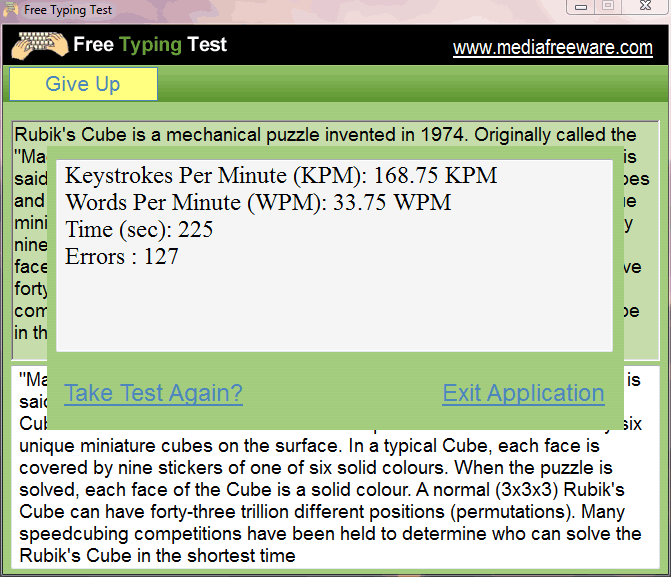 It displays the typing speed in characters per minute (CPM), Characters per Second (CPS) and Words per Minute (WPM). You can choose the interface and your own wallpaper to be displayed in the background. 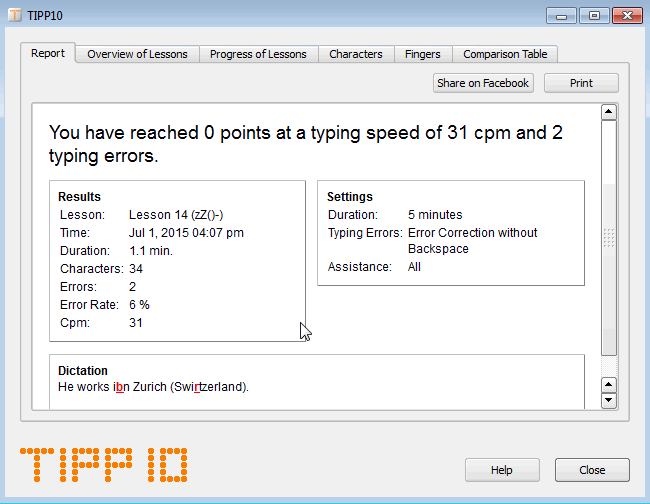 TIPP10 is a free software which lets you test your typing speed. It supports intelligent text selection, which results in the increased frequency of the characters on which errors occurs the most. It provides the detailed reports of the performance which consists of progress of lessons, characters: target errors, actual errors, frequency, error rates of different fingers, and comparison table. It lets you choose the type of typing test you want i.e. time limit, character limit or the entire lesson. You can select your own response of typing errors. 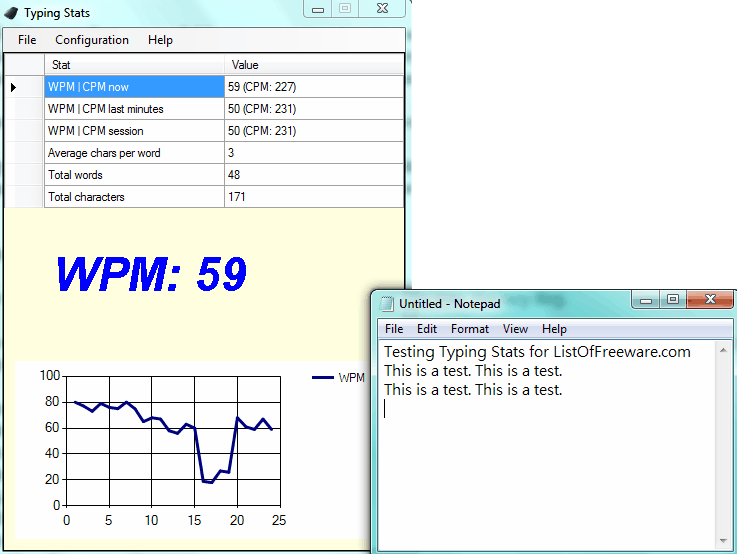 Typing Stats is a typing speed monitoring tool available for free. It monitors your typing speed in the background. It calculates your typing speed and provides statistics of the same on its interface. Just run the program and minimize it. Now you can start your typing work as normal, for e.g. typing a letter in MS Word, or taking notes in Notepad. It monitors your speed in the background. It shows the graph of your typing speed, Word per Minute (WPM), WPM / CPM (Now, Last Minute, and Session), Average characters per word, Total words, and Total characters. You can save the report in TXT format as well as to clipboard by using respective command from File menu. You can change its preferences like closing minimizes to tray and start with Windows automatically from Configuration menu. Overall the program is easy to use and understand. 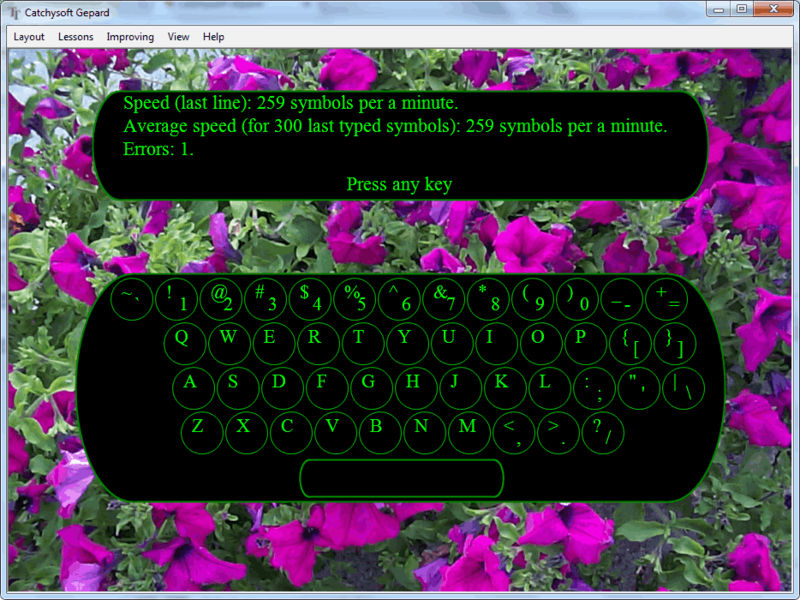 Typing Test is an application for Windows to test your typing speed. It monitors speed and accuracy of your typing. It includes two different testing templates: Basic and Advanced. It also has an option to add your own test template. To start testing, you may select basic or advanced template, or create a new one. Press Enter after you are done typing the text, and the test will be over. You can also use Backspace key to do corrections. The application is case sensitive, so while typing it will detect case sensitivity errors. In result, it provides you the typing speed in WPM and also the number of errors.